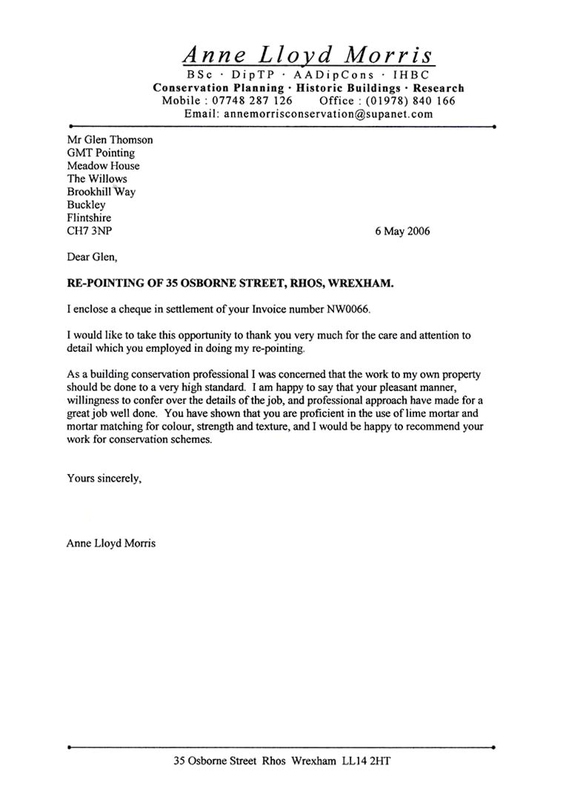 We take great pride in our work and are pleased to share some of the letters together with other reviews/testimonials we have received from our many satisfied clients. It is very satisfying to find a Company who treats a Customer, as a Customer should be treated. You carry out your work to a very high standard, but at the same time take care and consideration to surrounding properties to ensure any mess created, is cleared at the end of each working day, and our neighbours were very appreciative of this. 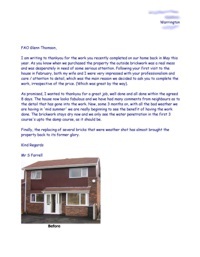 Just a brief letter to thank you for a job well done at our home in Parkgate. The work as you know was to re-point the complete outside of our house and when you had finished the house looked much better. 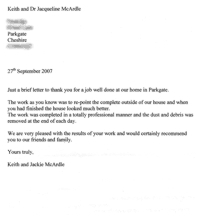 The work was completed in a totally professional manner and the dust and debris was removed at the end of each day. 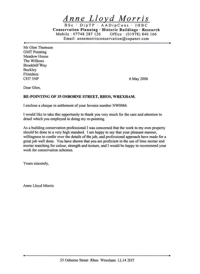 We are very pleased with the results of your work and would certainly recommend you to our friends and family ." I would like to take this opportunity to thank you very much for the care and attention to detail which you employed in doing my re-pointing. As a building conservation professional I was concerned that the work on my own property should be done to a very high standard. I am happy to say that your pleasant manner, willingness to confer over the details of the job, and professional approach have made for a great job well done. You have should that you are proficient in the use of lime mortar and mortar matching for colour, strength and texture, and I would be happy to recommend your work for conservation schemes." I am writing to thankyou for the work you recently completed on our home back in May this year. As you know when we purchased the property the outside brickwork was a real mess and was desperately in need of some serious attention. 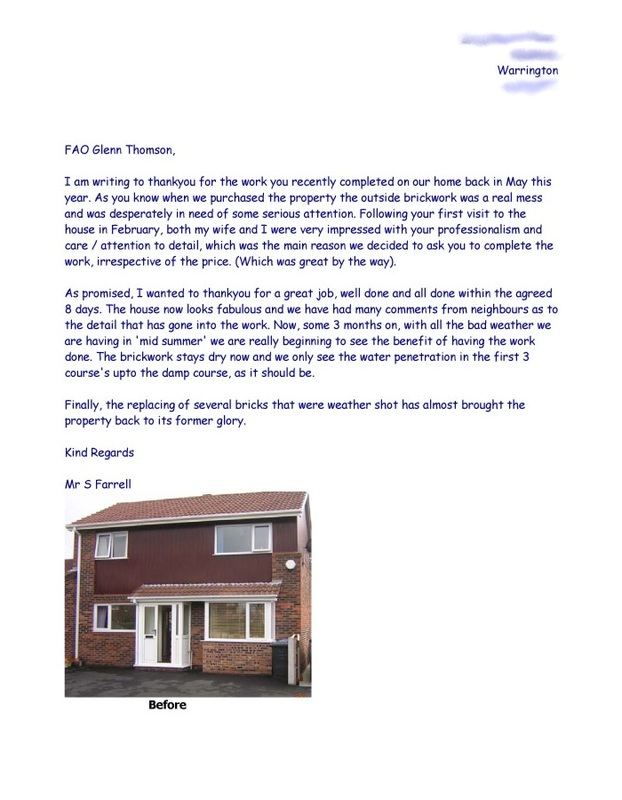 Following your first visit to the house in February, both my wife and I were very impressed with your professionalism and care / attention to detail, which was the main reason we decided to ask you to complete the work, irrespective of the price. (Which was great by the way). As promised, I wanted to thankyou for a great job, well done and all done within the agreed 8 days. The house now looks fabulous and we have had many comments from neighbours as to the detail that has gone into the work. Now, some 3 months on, with all the bad weather we are having in 'mid summer' we are really beginning to see the benefit of having the work done. The brickwork stays dry now and we only see the water penetration in the first 3 course's upto the damp course, as it should be. Finally, the replacing of several bricks that were weather shot has almost brought the property back to its former glory." I would like to thank you very much not only for your superb workmanship but your sympathetic attitude towards a very old building recently discovered to date back in parts to the 14Century, making it one of the oldest remaining intact properties on the Wirral. You worked closely with the Conservation Officer and advised me on every step of the work carried out to the Hall. I cannot thank you enough it has been a pleasure to have you working here, you did a clean and tidy job leaving the property without rubbish of any sort. Without a doubt I would highly recommend you to anyone wanting a job done to the highest standard. Our house in West London is part 1800's and part Victorian and has different styles of brickwork. Due to previous building and repair works and various types of pointing and colours it looked as though it had been stitched so it was decided to completely repoint the whole house. Because of its age and the state of the pointing we required a specialist to take care of the project. We found Glenn Thomson of GMT Pointing Specialists Limited. He came from Wales to London to personally carry out the work and we found him courteous, respectful of our home and property and, importantly, used his extensive knowledge and experience to restore our house to its former glory. We are thrilled at the outcome and would thoroughly recommend him for all types of pointing work. GMT Pointing Specialists restored our garden wall to its former glory, a 120 feet Victorian garden wall that was in very poor condition. GMT not only re-pointed our wall with lime mortar but also repaired it. Its owner, Glenn Thomson, is a highly skilled worker who is a master of his trade - a Master Craftsmen. His work is creative, productive, outstanding. He goes 'the extra mile' to achieve the desired result. Most notable were the endless compliments from the neighbourhood about the wall and Glen's work not only after its completion but throughout the project. Truly amazing! We were extremely pleased with the workmanship of GMT Pointing Specialists, and highly recommend the company to all those seeking a professional re-pointing service. Fantastic service, great price, friendly to deal with. Highly recommended. 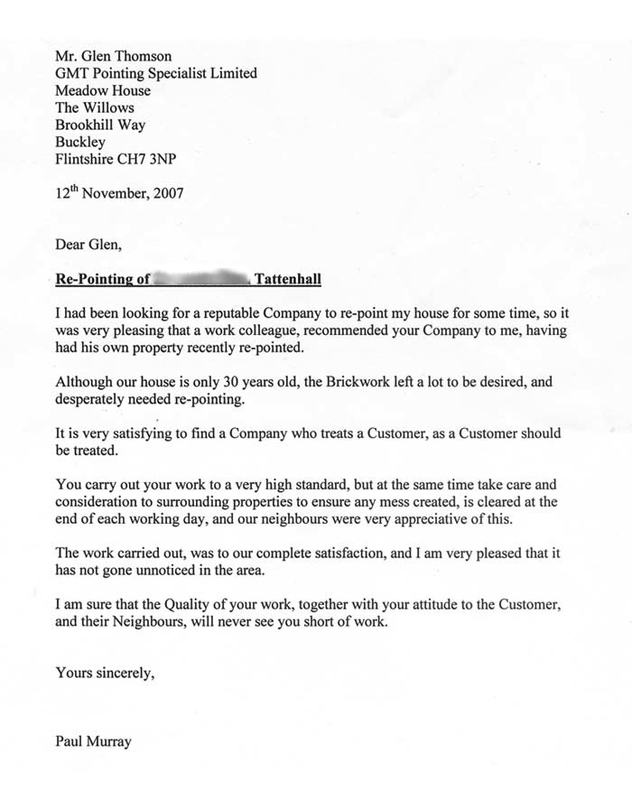 Was very pleased with GMT pointing workmanship my house looks great now my property is grade 2 listed and had to be completed to the highest standard I would recommend Glenn without hesitation. G.M.T recently completed a wall repair for me, they were recommended to me by a friend who had used them previously. 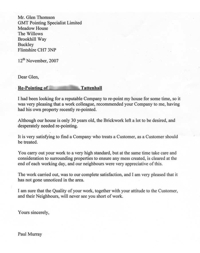 I was very pleased with the service, all work was carried out when they aid they would to an excellent standard. I wouldn't hesitate recommending them or using them again myself.